The Aquasoft™ P-11 Twin under-sink Drinking Water Filtration System provides excellent protection against Chlorine, Particles, cysts, bad odours and improves taste from your tap water keeping the essential minerals intact. The Aquasoft™ P-11 under-sink Filter System comes with everything you need to install, this under the sink water filter. The filter unit installs under your sink, while the faucet is installed at the corner of your sink. The provided tubing can be cut to length. Mount the filter unit inside your sink cabinet. Then install the provided "T" connector or saddle valve provided at your cold water faucet valve. Install the included dispenser faucet on your sink or countertop. Cut one piece of tubing to fit between the cold water inlet "T" and the inlet of the filter unit. Cut the other piece of tubing to fit from the unit outlet to the dispenser faucet. All tubing connections are push-fit for easy installation. NSF certified for NSF/ANSI Standard 42 for filter media carbon based only. 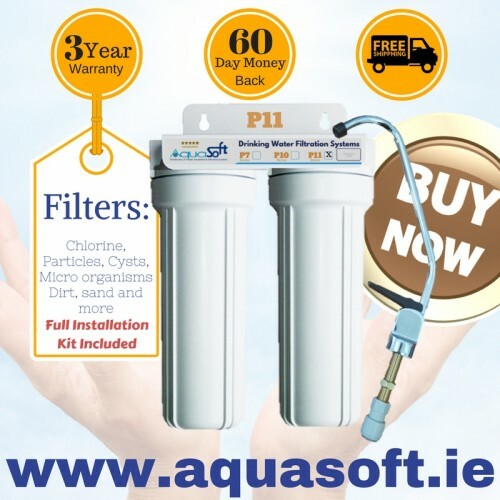 At Aquasoft™ Ireland, we supply high quality filter media and NSF® certified and the Water Quality Association® brands which offer the best quality and safety in drinking Water Filtration. Aquasoft™ uses trusted brands like Watts®, Dow® Filmtec membranes, Everpure® and Doulton® when supplying, installing and servicing water filtration systems. Safety and Quality of your drinking water media should always be a first as we consume it through our bodies. Aquasoft™ Ireland, Carbon Block 10 Micron Water Filter 2½'' x 10'' inchesPerfect for campe..
1 Micron White Sediment filter 2½" x 10" Spun Polypropylene1 Micron Sediment filters are effecitve a..
Aquasoft™ Ireland, Carbon Block 5 Micron Water Filter 2½'' x 10'' inchesPerfect for campers and..